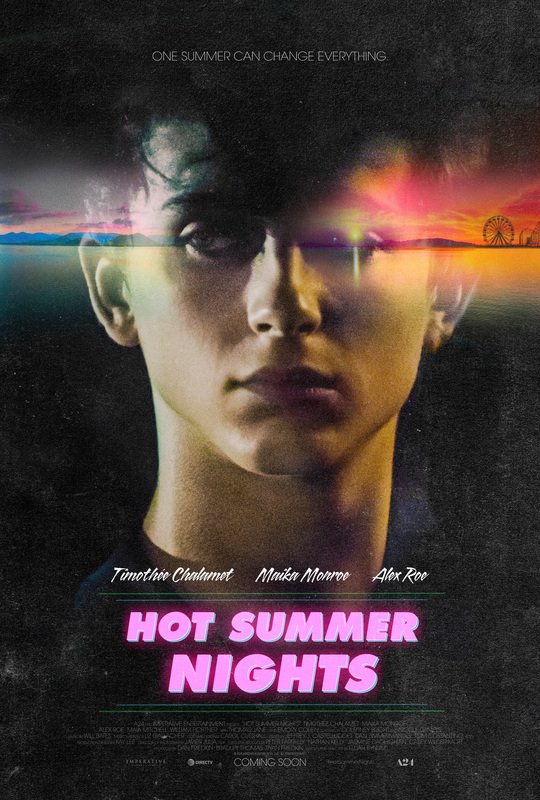 Visually appealing as it may be, Hot Summer Nights can’t decide what movie it wants to be and as it pings to one type of story and then pongs back to another, it loses viewer’s empathy and interest. There is no doubt that the film is an homage to the ne’re do well teens of The Outsiders, the suave cool edits and boy wonder sparkle of Baby Driver and the epic drug story of GoodFellas, but unlike those memorable films, this one does not have enough character development, focus or pizazz to pull off its objective. It uses third person narrative sometimes and sometimes not. It breaks the fourth wall and then doesn’t. It has some artful shots and then some filmmaking 101 shots. It makes for a very bizarre combination that pulls the viewer out of the world of the film. Daniel Middleton (Timothée Chalamet) is an average kid from an average town. His life changes forever when he is sent to live in a posh, wealthy community for the summer. He is lonely and bored and directionless until he helps Hunter Strawberry (Alex Roe) escape a drug arrest. Hunter is the mysterious, strong, handsome kid in town with a dark side and lots of secrets. Most believe that he has killed a man. As Daniel spends more time with Hunter he also becomes embroiled in the drug world and the plot becomes predictable. The characters get too deep into the business, they try to double cross a seller higher up, they have to pay for their mistakes. The primary love story is also plain and predictable. Daniel catches the eye of McKayla (Maika Monroe) and he can’t stop thinking about her. They have several run-ins and eventually hook up. She is the girl who everyone thinks is a sleaze but ends up being pure of heart and innocent, and also Hunter’s little sister. Hunter begs Daniel not to date her and…you know how this story goes. The performances in the film are solid, as much as they can be with the murky script. As one could predict from his impressive body of work Timothée Chalamet’s performance stands out. His body language, expressions, and voice inflections are so natural that it feels as if he truly is Daniel. The music in the film was interesting and unexpected. Composer Will Bates found a way to replicate the feel of music from the 1990’s (in which the film was set) without being clawing or effusive, he has just the right touch. No film from the 1990’s would be complete without a pop soundtrack to match the score and Hot Summer Nights does not disappoint in this area. From Linda Ronstadt and Roxette to Mott the Hoople and The Zombies, the music is one of the best parts of the film. Unless you go to see Chalamet’s performance, or to kill some hours in an air-conditioned theater, I would give this one a pass until you can see it streaming or for free.